I love starting a new quilt! I really have no business starting something new, when I should be starting the last (yipee!) block of Friends of Baltimore, but it’s what I do! The more quilts I have one the go, the happier I am. I believe that a body in motion stays in motion and creativity breeds creativity! So, this is what I did today….I played! This quilt is called Annabelle. It is based on a quilt made by Ann Daggs in New York and dated 1818. This is my focus fabric. I think of choosing fabrics for a quilt like choosing actors for a movie. Only one fabric (or actor) can play the leading role. And, no movie is complete without a supporting cast! So, once I chose most of my fabrics, I started cutting, prepping and audtioning. At this stage, I just lay everything out on the paper pattern and play! Once I “say yes to the dress”, I start to glue pieces onto the background. I like to give myself lots of options. I have chosen 3 different fabrics for the leaves. I love them all! « The Sun is Shining! That is a tough choice for the leaves, but the fussy cut flowers are devine. I love to fussy cut and pulling fabrics is a favorite activity. Love the first option the best! See you Sunday! I have finished all 24 blocks of Kim Mcleans Flower Garden, yippeeeee! What a great analogy! 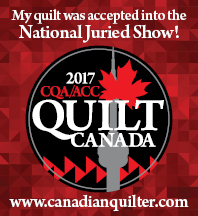 I love starting new quilts too – so much fun doing the auditioning. Fabulous leaves. Have fun!! I totally agree that creativity breeds creativity–keeps our minds thinking for sure! Love your fussy cut flowers. They are wonderful! Beautiful stuff Kerry… Love your fussy cut bud and the leaf choices are perfect! Can’t wait to see it grow. Oh I love all your fabric choices. It is fun to start something new, but too many new projects weigh heavy on me, so I try to keep it down to three at a time. I am looking forward to seeing how this one progresses. Kerry, your focus fabric is gorgeous! I think you’re right about creativity breeding creativity. Maybe I need another project to whet my whistle. Is the pattern called Annabelle, or is that your name for it? Thanks. It is a pattern from one of the Australian magazines, and it is actually called annabelle. Such beautiful and rich looking fabric you have chosen. Is it current or from your stash?